Register Soon to Save Your Seat! Tickets have been selling like hotcakes for Pollinator Day! If you're concerned about the plight of bees and would like to learn how you can help, then join us as pollination biologist, Susan Chan, outlines simple, on-farm strategies to conserve habitat for native pollinators and other beneficial insects. Tickets are $30 each and include lunch and a copy of our Landowner's Guide to Conserving Native Pollinators in Ontario. If you'd like more information, you can vist the event registration page, or you can purchase tickets below. Local Food In the News! Recently, FAW Director, Pat Learmonth, visited Queen Mary Public School to talk local food with our friends from the Peterborough County-City Health Unit, and CHEX TV. Come Celebrate the Wonderful World of Native Bees! On Saturday November 1, 2014, Farms at Work will present this full day workshop designed for farmers, landowners and concerned citizens. 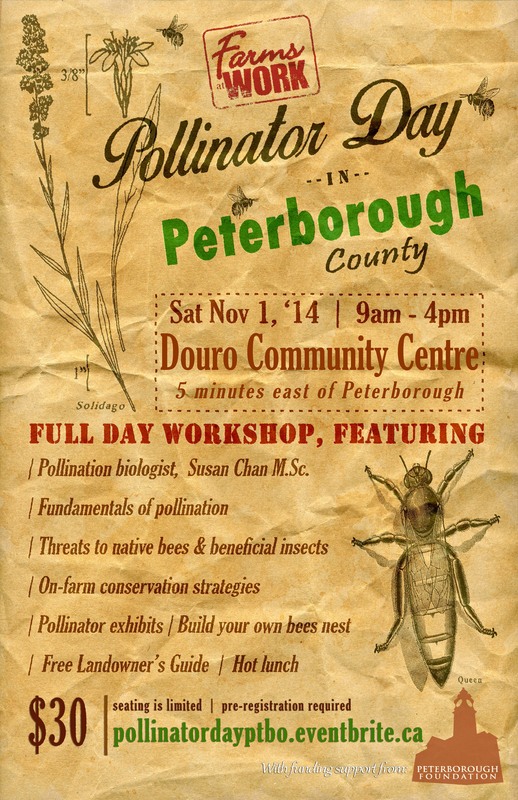 Pollination Biologist, Susan Chan will outline the fundamentals of pollination, as well as habitat requirements for pollinators and beneficial insects. Case studies will be presented, and strategies for mitigating threats to pollinators will be proposed. Susan has been invited to give presentations to thousands of people across Ontario, and her extensive research is inspiring farmers and landowners to implement pollinator conservation plans on their own properties. Our special guest, Dr. Rosana Pellizzari, Medical Officer of Health for Peterborough City and County, will speak to recent research completed by Public Health Ontario on neonicotinoid pesticides. Participants will each receive a copy of Farms at Work's A Landowner's Guide to Conserving Native Pollinators in Ontario, and will participate by building a nest for cavity-dwelling bees to take home for use on their own properties. There will also be ample time to visit the Pollinator Exhibition, where participants can interact with stewardship organizations and regional businesses that provide pollinator-friendly plant material and services to landowners. If you operate a native plant nursery, or are part of a stewardship organization, and would like to become an exhibitor, please let us know! Tickets are $30 each and include the Landowners' Guide, a bee nest and lunch. Spots are filling up very quickly for this exciting workshop, so make sure to register early! To purchase tickets, go to: www.pollinatordayptbo.eventbrite.ca. We'd like to formally thank and recognize the generous support of the Peterborough Foundation, without whom this event would not be possible. Late summer is always a crazy time of year for farmers, rife with long harvest days and countless hours standing in parking lot farmers’ markets. 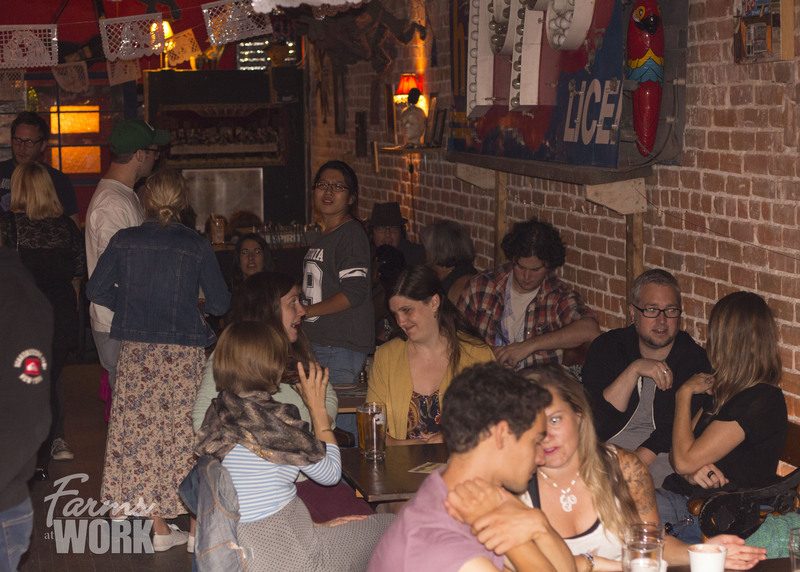 So we were more than a little surprised when literally dozens of new farmers from around Peterborough County and beyond flocked to the Spill on Saturday night to unwind, catch up with friends, and enjoy some live music. Complete with several delicious Night Kitchen pizzas, some delectable Dan LeDandan drinking chocolate, and the doo woppy/jazz stylings of farm band, The Sandy Pockets, the stage was set perfectly for an evening of mixing and mingling. Based on feedback we’ve received already, these events have become valued opportunities for new farmers to meet and interact with our growing agricultural communities. They’re also pretty great ways to maintain some semblance of a social life during the grind of a long farming season. While networking and community engagement are vitally important to the success of any farmer-entrepreneur, so too are those opportune moments to have some fun! We’d like to thank everyone who came from far and wide to celebrate farming, food and community with us this weekend. Stay tuned for details on our next mixer soon!